At first, I wasn't sure I was going to like this deck, but it seemed to just kind of "grow" on me as I began to use it more in Tarot readings -- and clients requested this deck a lot for readings. It's actually a very delightful and charming deck of tarot cards. Each of the cards depicts a night scene, with the exception of the Sun Card, which shows a bright and glorious sunny morning. Some readers dislike this deck because they feel that it's too "cute," however, I think of it more as being a "magical fairyland" type of deck. It is a fun and enchanting deck to read with, once you become accustomed to it. There are no frightening images in this deck, so it's a good choice for the beginning young reader or anyone else that either wants to read the cards or get a reading but is hesitant about the traditional images of most decks. 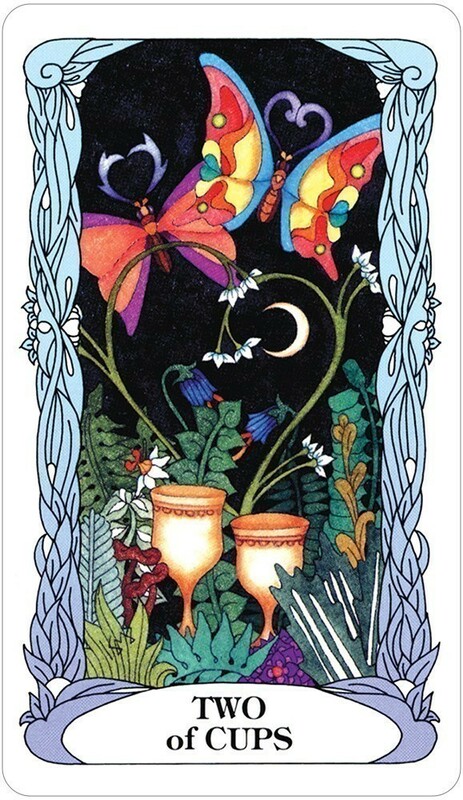 Tarot of a Moon Garden reduces any "harshness" that may be found in some decks. You'll find delightful images such as flowers, castles, fairies, dolphins, and hot air balloons. 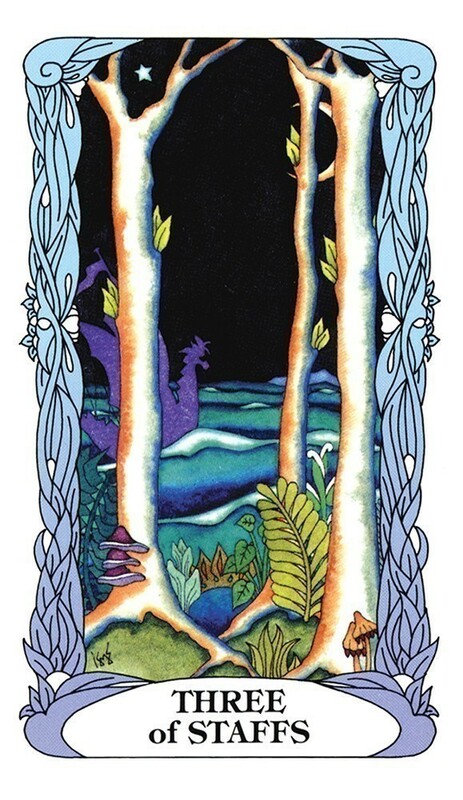 Artist Marie Sweikhardt works with the idea that the moon is an enchanted place with whimsical creatures, lush jungles, mysterious caverns, and exotic flowers -- like a lunar Garden of Eden. It is a soft and gentle deck that follows the Rider-Waite tradition and symbolism but in a much calmer way. It's a deck suitable for reading for or about children as well. Although not the deck for everyone, it's certainly a welcome change for a few moments of escape into an enchanted land of childhood magic. When the mood is whimsical, this can be a very nice deck to turn to. 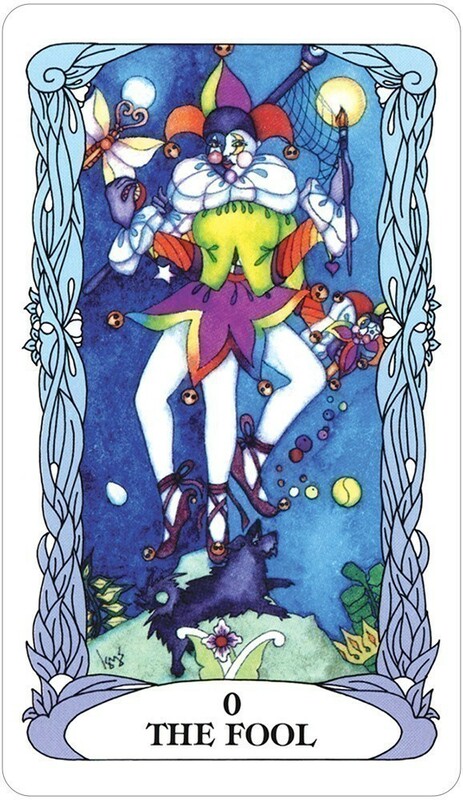 In August 2007, Tarot of Moon Garden was reintroduced and is once again available. So if you missed it during a time of being out-of-print, it's available again. This imaginative deck weaves traditional images with mythic expression and elemental magic into a 78-card deck full of inspiration and insight. 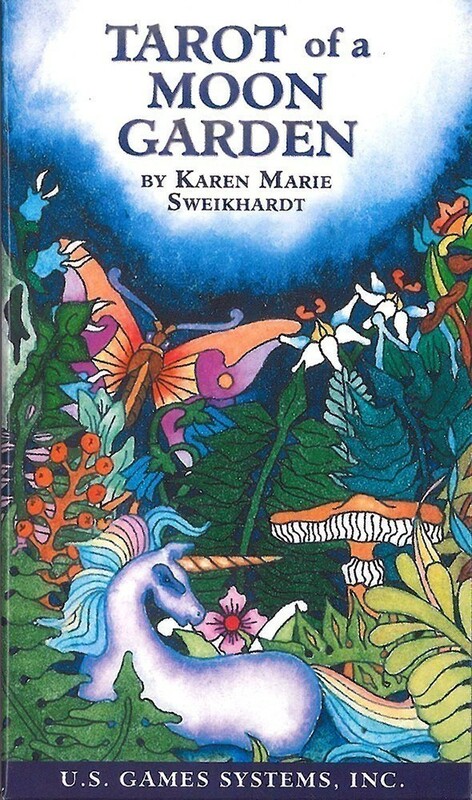 Beautifully illustrated by Karen Marie Sweikhardt this whimsical, full-color deck depicts an enchanted garden with exotic flowers, castles, and hot air balloons. The first thing that grabbed my attention was the colors and dreamlike images and it was a real pleasure to work with. The card stock is terrific and shuffles very easily and the image on the backs are not only reversible but intricate and pleasing to the eye. 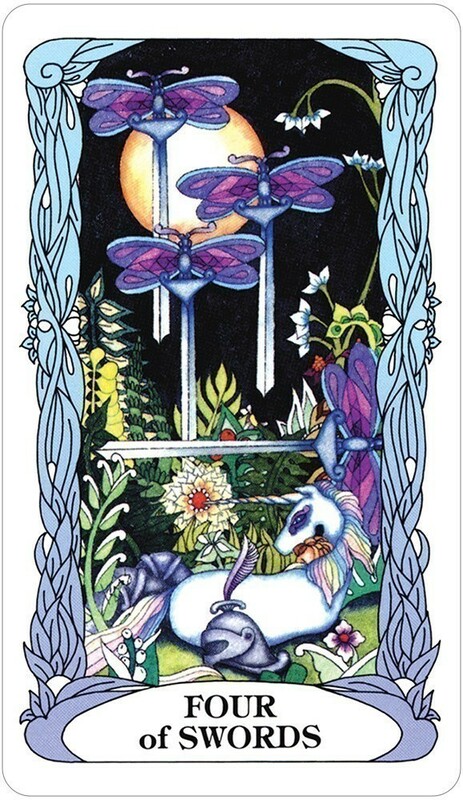 The Major Arcana are stunning to look, at depicting fairies, dragons, butterflies and unicorns and even the moon herself makes an appearance in several of the cards. The Minor Arcana have dragonflies for the hilts of the Swords suit, mystical trees in the Staffs suit, there are butterflies, ferns and other foliage in the Cups suit and the Pentacles suit with it's large pentacle orbs floating across it's images. This deck is a delight to look at and definitely a joy to work with and makes a terrific deck for both beginner and experienced alike. 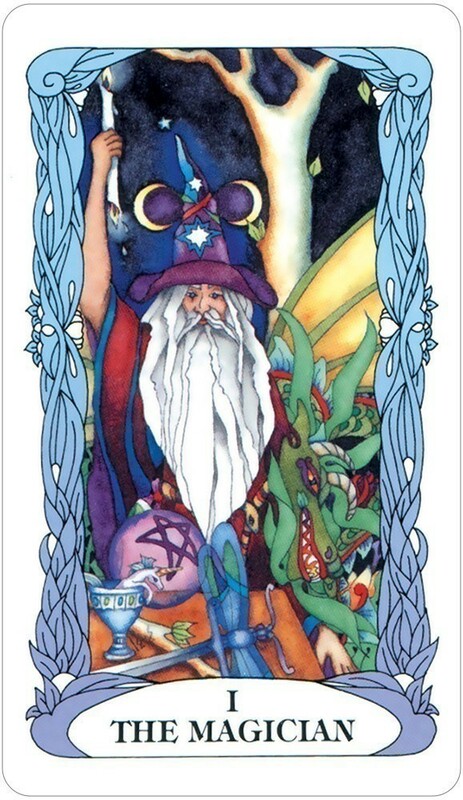 The Tarot of a Moon Garden deck was my 8 year-old son's first deck, given to him on his 6th birthday. The cards have been described as very feminine and romantic but we find them, instead, very gentle and magical. It is the perfect first deck for any young witch or wizard or of course for those young at heart. 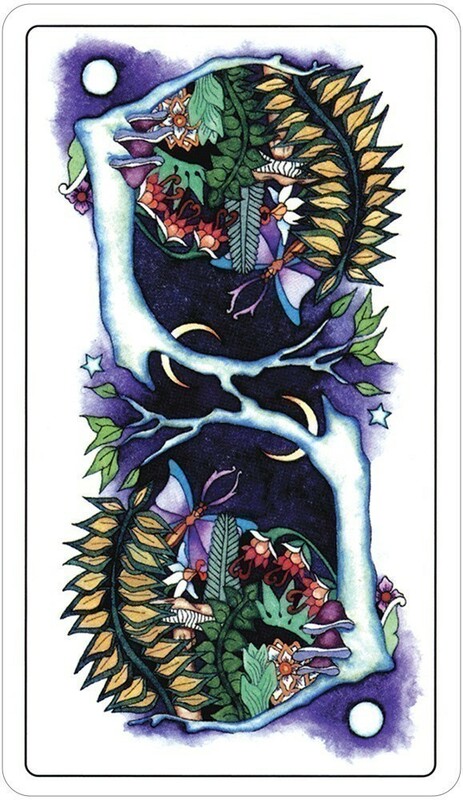 The cards are easy to read and are filled with beautiful images and great detail. From the moment they're taken out of the box they seem to exude a kind of soft, magical transcendence. For a young reader they're just the thing to open the mind and senses to the "elsewhere". Reading these cards or having them read for you, transports you to a gentler, more magical time. Every card in the deck, major and minor Arcana alike, brings one closer to a more innocent yet mysterious way of being. Even the death and devil cards are done in such a way as to adhere to the old standards (which I much prefer) and yet convey the message in a gentle, non-frightening way. One would be hard put to find a better deck for the up and coming spiritual generation. Indeed, my number one recommendation for a child's first set of tarot cards would have to be the Tarot of a Moon Garden. The moon is an enchanted place with whimsical creatures, mysterious caverns, lush jungles and exotic flowers. Sweikhardt weaves the traditional tarot symbolism into her images of a lunar Garden of Eden where there are dragonflies, butterflies, dolphins, dragons and unicorns around every corner. 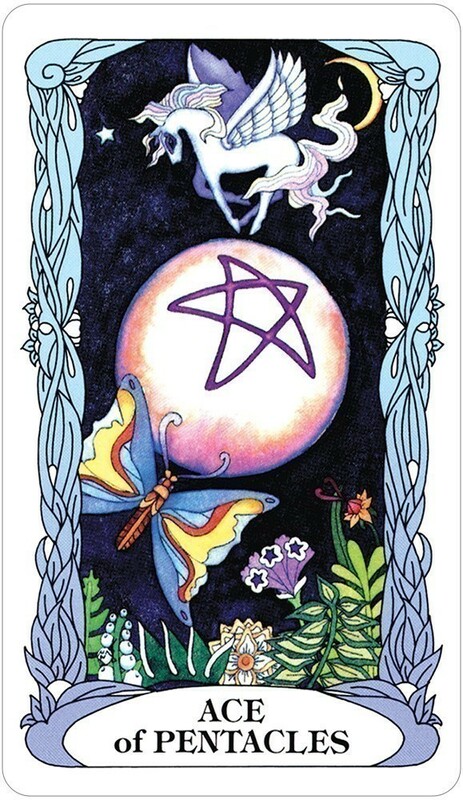 The inspiration card states Welcome to a Realm Where Myth and Magic are the Reality. Journey into the Moon Garden and reflect on the phases of the lunar energy. It is a very bright, bold, and colorful deck taking you to a time of magic as it weaves traditional tarot symbolism, mythic expression and elemental magic. A tapestry for you to discover. As Sweikhardt states she started this as a poem, Moon Garden, and from there it blossomed into this wonderful fanciful enchanted deck. It will soon be, if it is not already, a collector’s item, one you will want for your own collection, or just to have. Great for using and reading children, or for children to explore the Tarot. My friend bought me a deck of cards as a gift. The deck was The Tarot of the Moon Garden. Immediately I felt soothed by its images of dancing fairies, protective dragons and lush gardens. Every card stirred feelings of hope and dreams achieved, even the cards associated with negative portents such as the Tower or the Devil. This deck is still my favorite and the ideal first set for anyone wishing to explore the mysteries of the Tarot. I find them deeply emotional, describing how events affect the questioner emotionally rather than detailing events. I feel these cards empathize with the questioner, place a comforting hand on their shoulder or join in with the cheers when all is well. They are a positive, gentle deck, eager to find positive results from the most negative events, but not give you a false hope, a false sense of security, keen to show events you'll face, keen to reassure you of their support. They can be mischievous, I've never found any other deck with such personality, prone to mood swings if they're not treated right giving absolutely nothing to read, deathly silent especially if you query their advice. The fantasy beings depicted sum up perfectly these cards, encouraging the reader to dig deeper into a world of plenty, always offering encouragement. This is a set everyone should read at least once; they bring a rare innocent, childlike quality to an art often daunting when first practiced.